For centuries Jerez has been a city of great importance, which in recent years has been outstanding worldwide for its famous Sherry wine, a wine that has grown in its fertile lands. Jerez Airport (used by more than a million passengers each year), the race track and the many conferences that take place each year combine in a modern city that has retained its traditional charm. The cities´ artistic tradition has been preserved over time in examples as clear as its streets full of monuments, being some of the most characteristic the baroque Cathedral of Jerez and the Alcazaba, a Moorish legacy which has undergone a major restoration. 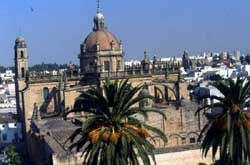 Jerez has been a stopping point for many civilizations throughout history: Phoenicians, Romans, Arabs and Christians have passed through this city and have left their cultural legacy. 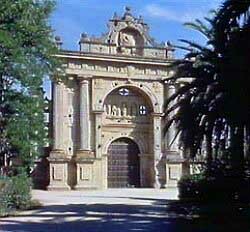 It is unknown the exact moment in which the population settled in this area, possibly the Tartessians or Phoenicians were the first ancestors of the people of Jerez. From the twelfth century with the arrival of the Arabs, took shape what is now the old city and walled perimeter. This wall was extended after the conquest of the city by the Christians during the thirteenth century. It was from this conquest when they built the largest number of religious buildings characteristic of that period in order to remove all traces of Jewish or Muslim belief. From the nineteenth and twentieth century began the destruction of certain religious enclosures such like a group of convents, and the construction of houses and squares that eventually destroyed parts of the ancient defensive walls and gates of the city. The growth of the wine cellars started from the nineteenth century, reaching great importance with the creation of the railway in 1854, which facilitated the transport of wine from Jerez to the rest of the peninsula. 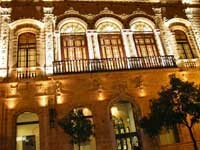 Jerez has a wide selection of options to enjoy your free time: Cinemas, exhibitions, theatres, discos, nightclubs, shops, shopping centres, monuments... being the horse and wine its two representative elements known internationally. 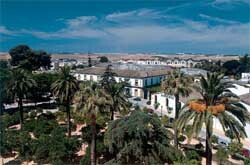 From horse shows at the Royal Andalusian School of Equestrian Art, to show races at Jerez circuit. The access road is well connected with the rest of Andalusia. Jerez International Airport is modern as well as its recently restored train station with connections to Santa Justa Seville, Madrid and Cadiz and elsewhere. To get to Jerez from Malaga take the direction towards Gibraltar, from where you can cross the Sierra de Grazalema Natural Park if you want to take the shortest route through Alcala de los Azules and Paterna de Rivera; you also have the option of driving along the coast passing through Tarifa and Chiclana.